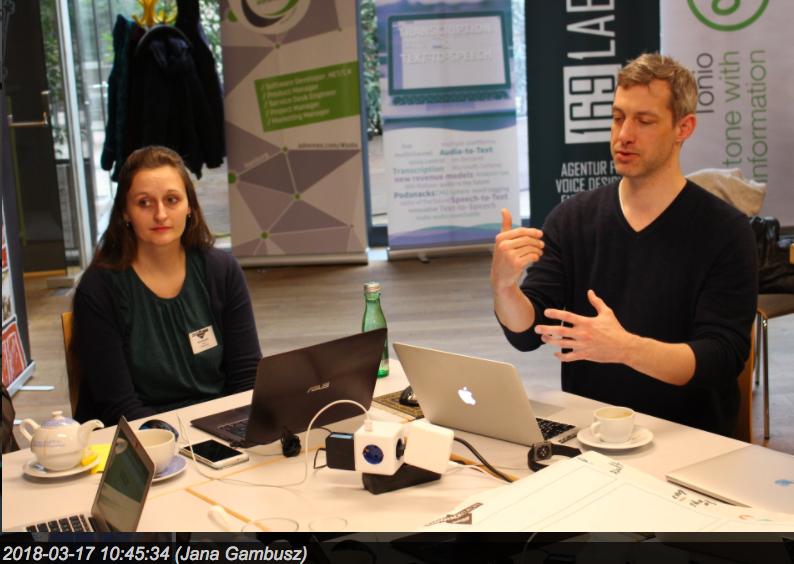 On 16–18 March, I participated in Radio Hack Europe, organised as part of the Radiodays Europe conference. I’ve been running media hackathons since 2014, but this was my first time as part of a team. Could I hack it? I really like Shortcut, but it has its limitations: it can only be used for This American Life, and only if you’re listening through their website. The power of a movie trailer or TV promo is clear. These videos (if well done) can make or break a project. A great trailer gets people’s butts in those $14 movie theater seats. In my business, the project isn’t visual — it’s a highly produced piece of audio, whether a 10-minute news feature or a 60-minute podcast. Audio’s version of “butts in seats” is a listen. Getting people excited about listening on social media is hard when there isn’t a technical solution for sampling a piece of content. You can’t upload an mp3 to Facebook, Twitter or Instagram. And the thing with audio is — it’s invisible. Her article claimed “the future of social audio is here”, but since their 2015 debut, have Audiograms become the industry standard though? Not as far as I can tell. Audioburst is doing some pretty interesting work when it comes to search indexing audio and using AI to clip snackable “movie trailer” chunks. Again, it’s a publisher tool, but in terms of searchability, it does have the potential to be the sea change the industry needs. They’re featured on Amy Webb’s list of 2018 Tech Trends for Journalism and Media. If you need more of an overview of what the heck Audioburst is doing and how they’re doing it, check out an interview of their Head of Content Partnerships, Dan Sacher in this episode of New Media Show. These challenges are also why it’s such an exciting time for audio. Growth! Experimentation! Professionalisation! On to the hack! I like how Teen Creeps shares audio on Instagram using Wavve, another paid publish-facing tool. Friday evening was to pitch ideas and form teams. With sharable audio in mind, I figured someone would pitch this topic and I could join up with them. Looking around the room, there were about thirty people, I was one of maybe two or three women. Organising diverse hackathons is challenging because organising hackathons is challenging. How can you get as many participants as possible, while encouraging diversity in skill, gender, age, ethnicity, etc.? This is something we try to address in the hackathon series I run, Editors Lab by Global Editors Network, and we have by no means cracked the code. Please note that building an inclusive media industry is a priority for the Global Editors Network, The Walkley Foundation and Google. As such, we strongly encourage you to build diverse teams. 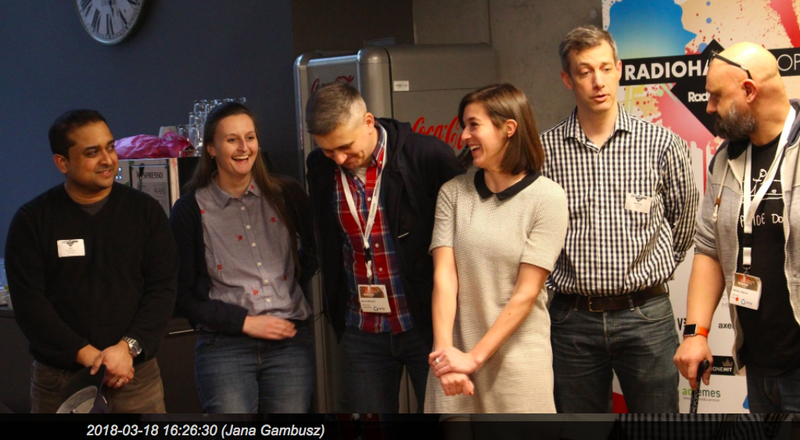 Measuring just the gender mix, out of 29 participants, that hackathon had ten women. This is a good ratio and also can be improved. Tl;dr: Building diverse hackathons is difficult will not happen unless you are thoughtful and deliberate. As folks began pitching, many were from tech companies with fully-formed ideas of what they wanted to build already. They were using the hack as time to dedicate to a product that was already in their pipeline. Fair enough, but where did that leave me, a non-tech person with only a problem and no solution? By around the fifth pitch, I still hadn’t heard any ideas related to sharable audio so I raised my hand. 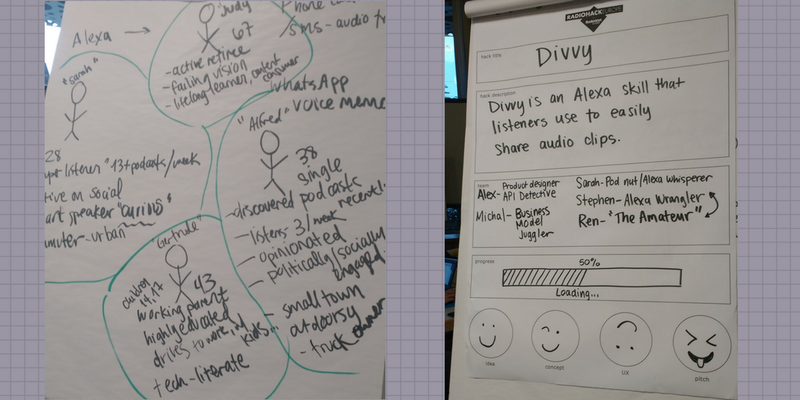 I told the group that I wanted to create a user-facing solution to address the problem that audio is hard to share. Someone asked, “So what’s the tool?” I said that I see a hackathon an opportunity to experiment so I was pitching a question instead of an answer. At this, I saw a guy in the second row do *praise hands*. An ally! Once the initial pitches were over, we were supposed to form teams around the ideas we wanted to work on. The guy in the second row turned out to be Stephen Harwood Jr., an engineer from David Systems. 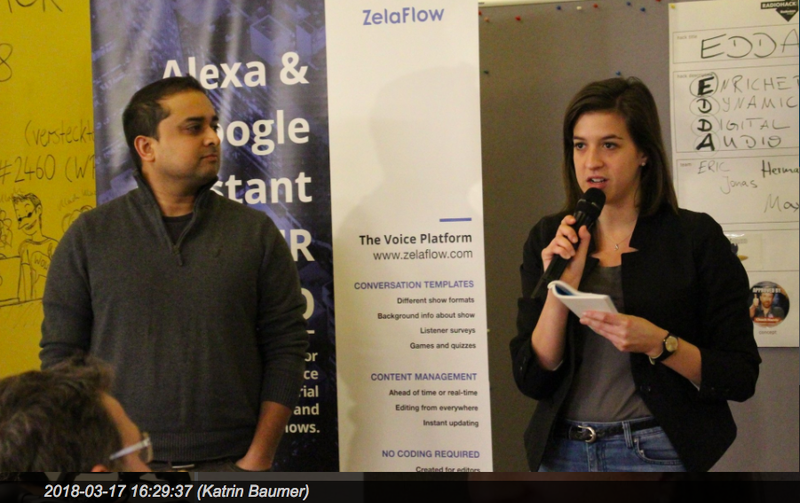 We joined up with his product manager colleague Alexandra Bauer, Michal Marcinik who heads up Radio Net and works on ad targeting tech, and CBC engineer Ren Ramkhelawan. 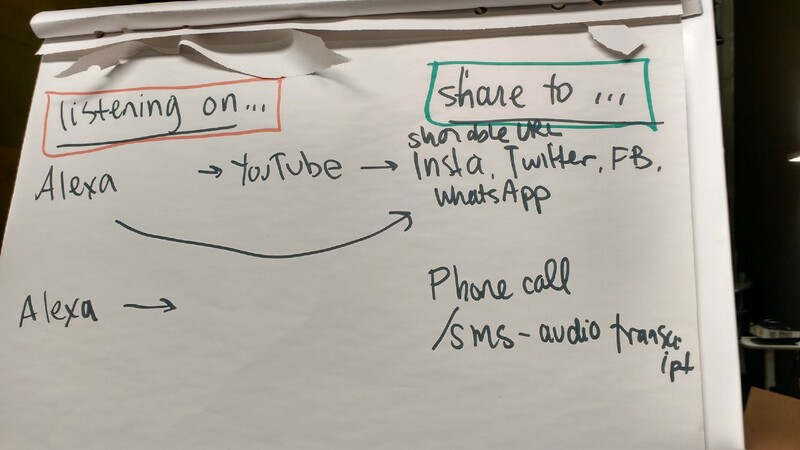 Where we’re listening and how we could share audio. We began to try to nail down an approach. As we started to work together, I was glad we formed an international team — Stephen and I are American, Alex is German, Ren is Canadian and Michal is Polish. Most of the participants were German speakers so I was glad to find myself in a team where it was natural to speak English as a group. We started by thinking of all the places where we listen to audio and then all the places we wish we could share it. We took a look at the existing solutions to pinpoint what was missing, why none of them had become a success story. Then we thought about smart speakers. We all got Amazon Echo Dots in our hackathon goodie bags and Ren develops Alexa skills for the CBC. 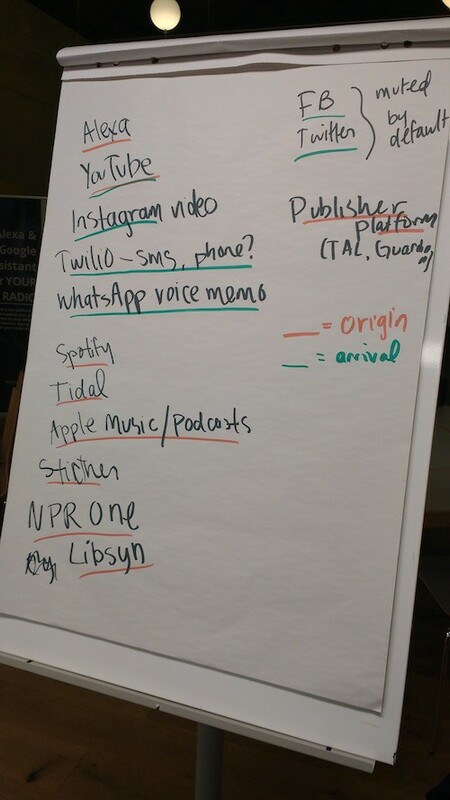 It became clear that the “new” thing we could try would be audio clip sharing via voice assistant. Eureka! So you’re listening to your favourite podcast and you think, “Hey that’s exactly what I was talking about with Hannah last week.” You can say, “Alexa, share the last 30 seconds with Hannah.” (Hannah’s my sister and does not listen to podcasts. If only I could easily share them with her…) The next question was: sharable how and where? For the purposes of the hackathon, Ren decided it would be easiest to demo sharing via SMS using Twilio. A listener would share a clip via Alexa and their chosen contact would receive a text with a link to the YouTube clip. A bit of platform-jumping involved, but hey, it’s a prototype! 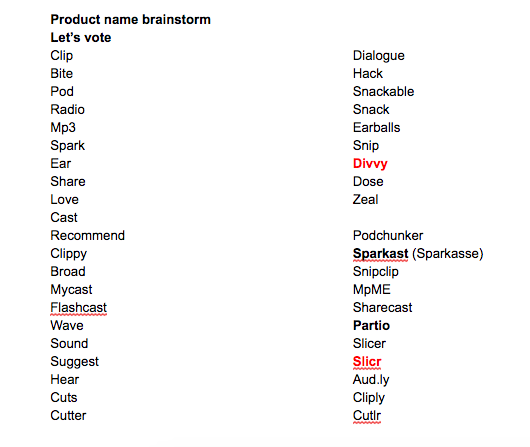 While our tech experts did their magic, I started to think about naming and branding. I did a thesaurus word vomit of all words related to audio, clips, and sharing to see if anything looked good. 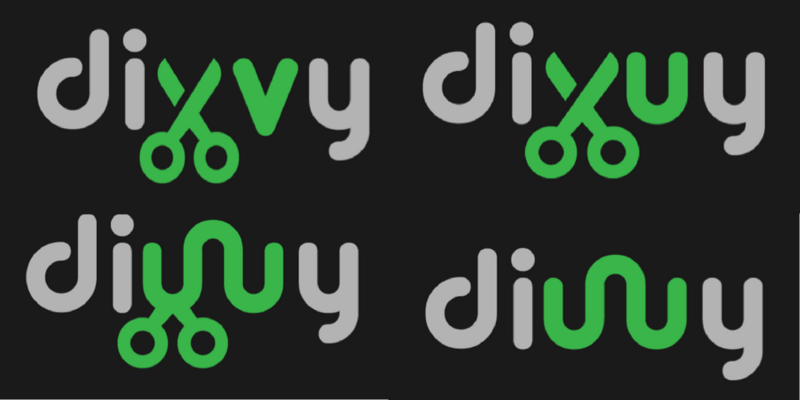 Everyone sort of had a soft spot for “divvy”. It didn’t have a vowel-less startuppy naming convention, and invoked the product’s function without using too common a word. Yes! I liked the sound of it. We were ready to fill out our “hack sheet” and give our interim pitch. Alex’s logo design tests: Should we use scissors? Waveforms? Both? Ren and Michal had worked until the wee hours on the demo. I knew that I would much more useful well-rested. Sunday morning dawned and we were sprinting towards the finish line! Alex is a graphic designer so she set to work coming up with a logo. Use your voice to amplify others. Share the audio you love with the ones you love. Alex and I also put together a few slides. 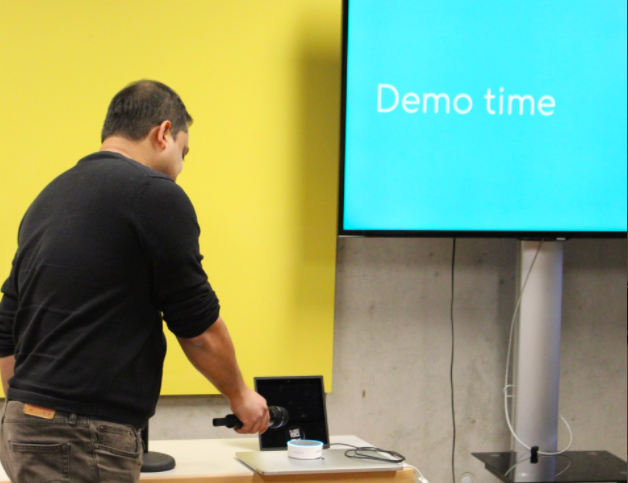 We all ran though our presentation with the demo and went into the pitches not feeling prepared enough. I began the pitch by laying out the problem and presenting our concept and then Ren demoed what we (okay, he) had built. Ren was nervous after the second attempt! I knew Alexa would come through for us. Third time’s a charm. We wanted Divvy to share a clip from CBC’s “Someone Knows Something” with Stephen. Of course despite numerous successful test runs, Alexa didn’t want to cooperate with us! Glancing nervously at the timekeeper, Ren said for a third time “Alexa, ask Divvy to share the last 30 seconds with Stephen” — and she agreed! Stephen’s phone buzzed onstage and the room applauded. It was actually the perfect demo in terms of building drama and getting the public to root for us. Sometimes you can’t plan the best moments. 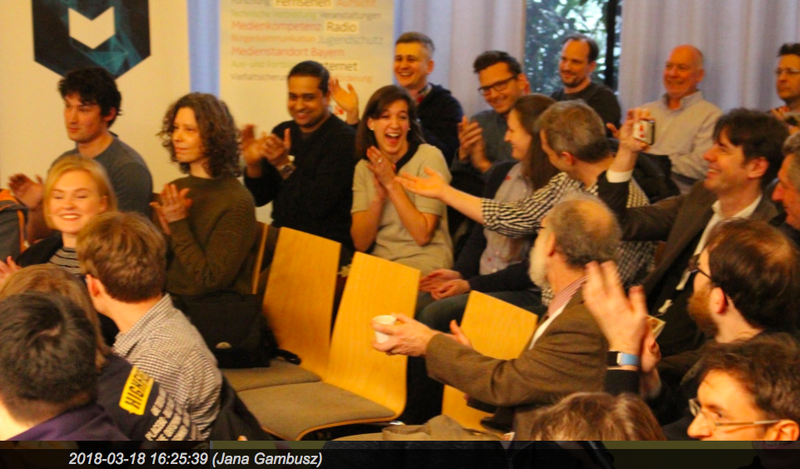 The Radio Hack was a great collaborative experience and the win was icing on the cake. 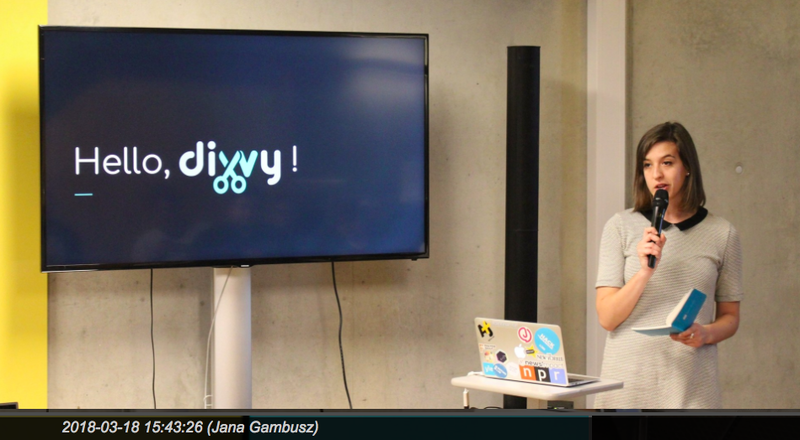 We got to pitch Divvy on the Radiodays stage the next day. I’m going back to mentoring Editors Lab participants with a renewed understanding of and respect for the hacking process. Great ideas are not — and should not be — earth shattering. A clever application of existing tech to solve a well-defined problem will do just fine.